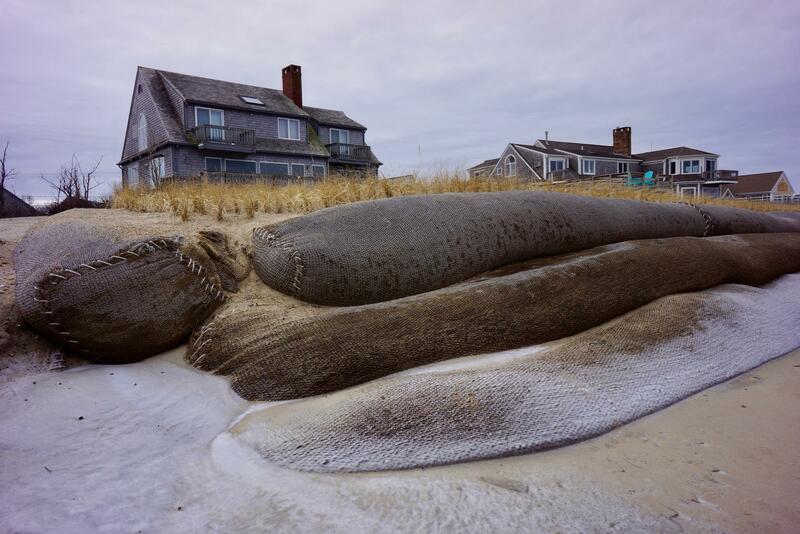 Uncovered barrier rolls in front of a private home on Town Neck Beach in Sandwich, Mass. These large rolls are made from coconut fiber and filled with sand and are designed to prevent beach erosion. Spring in our region typically means strong storms and serious erosion, and that’s getting worse with rising seas. Some beachfront property owners are shelling out thousands of dollars for a temporary fix. Laura Wing lives in a beachfront home in Sandwich. She inherited the house from her parents 40 years ago, but the beach has changed a lot since then. 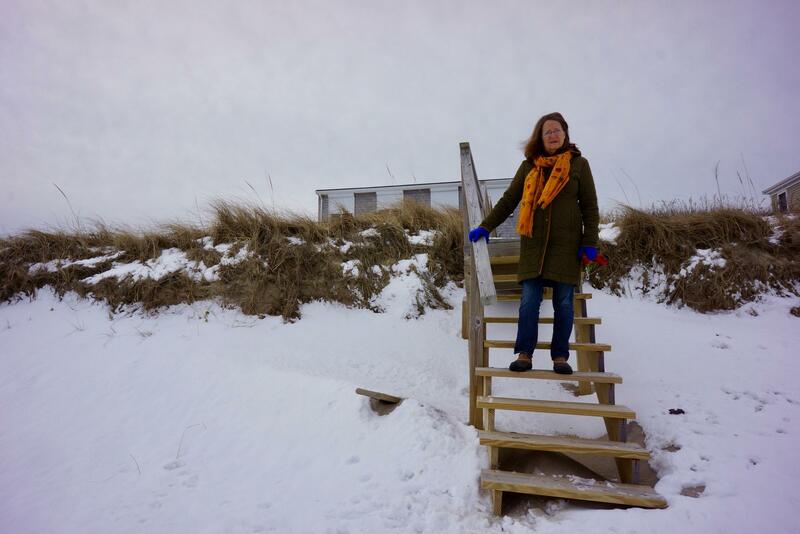 "The dunes went much further out on the beach, so over all this time it's just eroded away to what it is now," she said. These days the water is 50 feet from her home at high tide. It's typical to have houses right on the shore here on the Cape, and storms can cause a lot of damage. Laura Wing in front of her beachfront home in Sandwich, Mass. Wing has not installed barrier rolls. This natural dune helps protect her home from erosion, for now, but spring storms could make her home vulnerable. 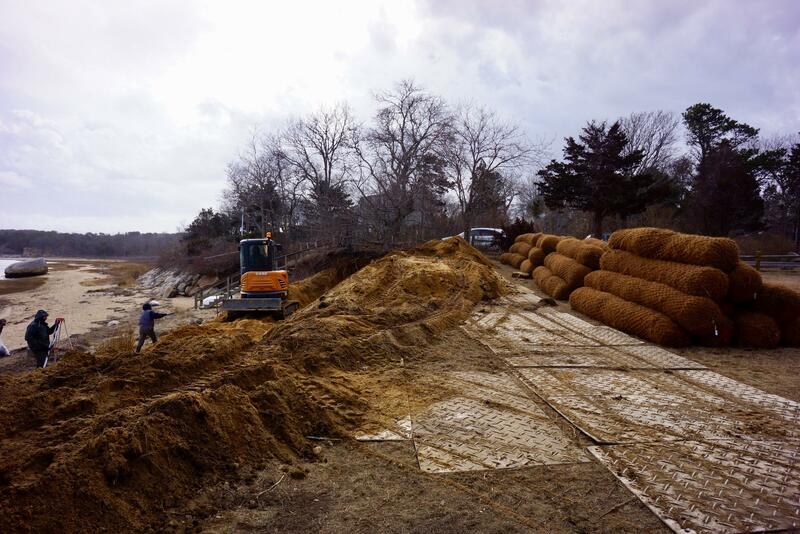 Wing has a costly decision to make: whether to invest $30,000 in fiber rolls, the most resilient method for slowing erosion that Massachusetts homeowners are allowed to use. The rolls are made from coconut fiber and are buried in sandy slopes in front of homes, to absorb wave energy and hold sand in place. They are filled with sand or coconut fiber and planted with grasses and shrubs; they vary in size, but they end up looking like dunes. Whatever Wing decides to do with her property could also affect erosion on nearby public beaches. According to Dave Deconto, the Director of Natural Resources for Sandwich, there is a beach in town where public and private land meet. The private homes on the beach have fiber rolls in front of them — the beach next to the rolls is pretty washed out and has lost a lot of sand. That's because any time you construct a dune, even a fiber roll dune, there's going to be more erosion where the dune ends and the beach begins. 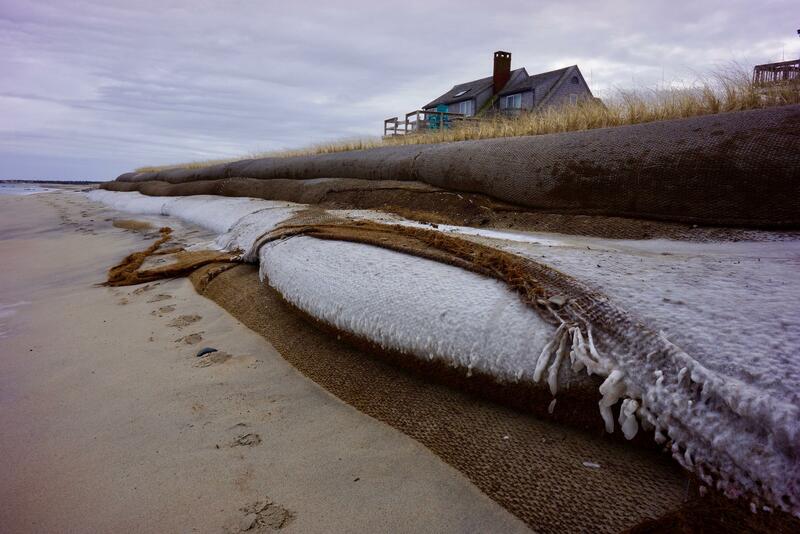 Uncovered barrier rolls in front of a home on Town Neck Beach in Sandwich, Mass. When the rolls are uncovered during the winter, they sometimes freeze and harden. There are other options for slowing erosion. Deconto says, one method called wave attenuation uses barriers to break up the wave action before it hits the coast line, but it hasn't been approved by Massachusetts environmental regulators. Whatever homeowners decide, Deconto says, all of the fixes are temporary. "Mother nature's gonna do what mother nature does," says Deconto. "Every town on the coastline of Massachusetts is dealing with it, every community along the eastern seaboard, and the Gulf Coast, and the West Coast of the United states are dealing with it." Fiber rolls are mostly being used by private homeowners right now because the high cost can be a barrier for small coastal towns, and because most buildings on public beaches are further inland and not as vulnerable as beachfront homes. Massachusetts officials recommend fiber rolls because they have a lower impact on natural habitats than other methods for slowing erosion. A crew installing fiber rolls at a private home in Orleans, Mass. These rolls are about 10 feet long and filled with coconut fiber. But, Wilkinson says, rocks disturb natural habitats and end up transferring the erosion to other places. So state environmental officials made strict regulations banning hard structures. The good news is, they are biodegradable. The bad news is, that means they may have to be reinstalled as often as every 5 years, though some may last decades. The price can vary from $200 to $2,000 dollars per square foot, depending on where they are installed and what materials are used. He says, he's had some hard conversations with homeowners. "And they're saying, 'I don't think I can afford to live here anymore. Repairing this bank or stabilizing this bank, will cost more than the value of my home.'" Laura Wing says she isn't going to install fiber rolls for now. "I can't cover that kind of expense by renting the house, so that just comes out of my savings. And I'm retired." She says she's taking things one year at a time, and hopes she doesn't lose her home in a storm before she decides to sell. This post has been modified to provide additional details on the price, life time, and composition of barrier rolls.